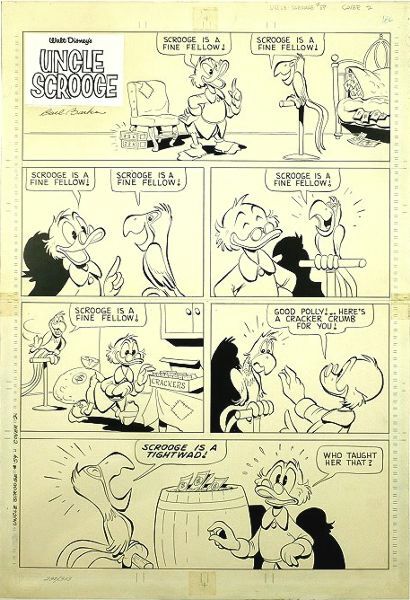 Example of surviving artwork from "Phantom of Notre Duck". 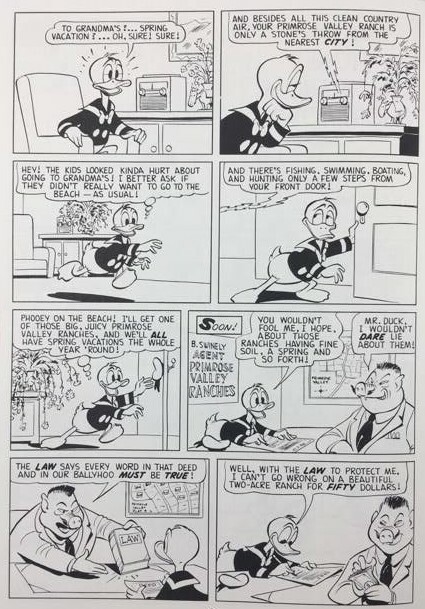 A beautiful example of a surviving original comic book page from the story "Phantom of Notre Duck" from Uncle Scrooge # 60 from 1965. 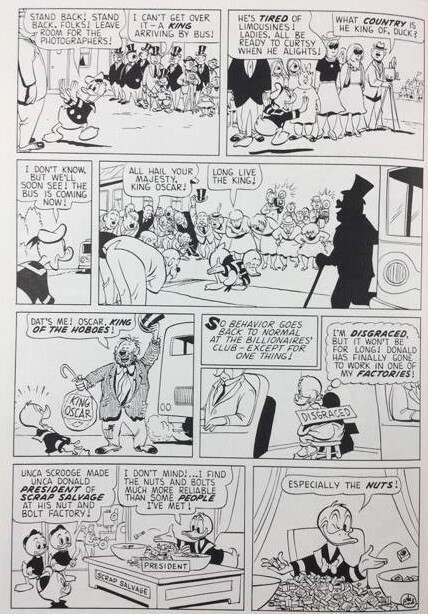 Carl Barks was a true master in story-telling and this page has a lot of action and details. Take a closer look at the big cathedral panel. The reader are practical in the same room as the ducks..! 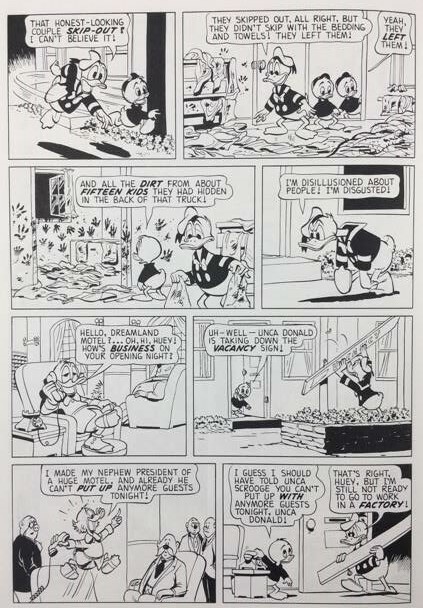 From this story Barks kept the first 2 pages in his own archive. Later he sold both of them. The artwork is kept in private collection. 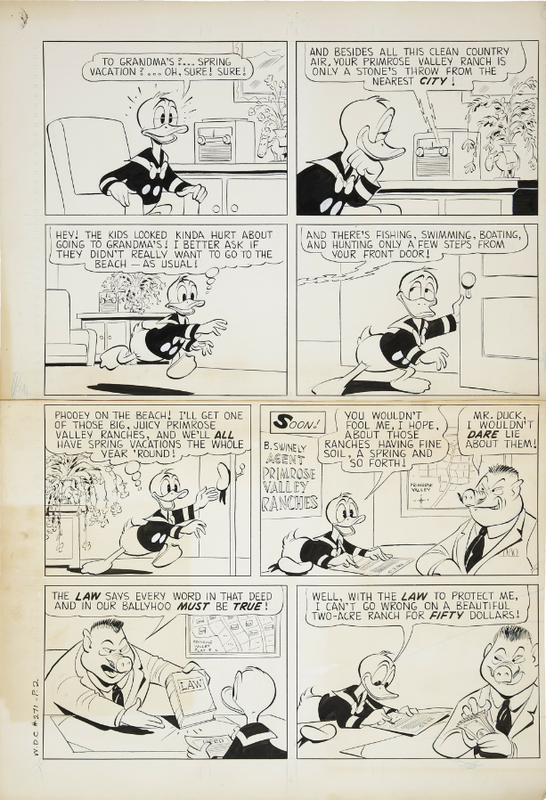 From this story the original 5`th and the 6`th panel of the 5`th page have survived. Unpublished artwork. The artwork is in private collection. Survived rejected artwork intended for US-32. 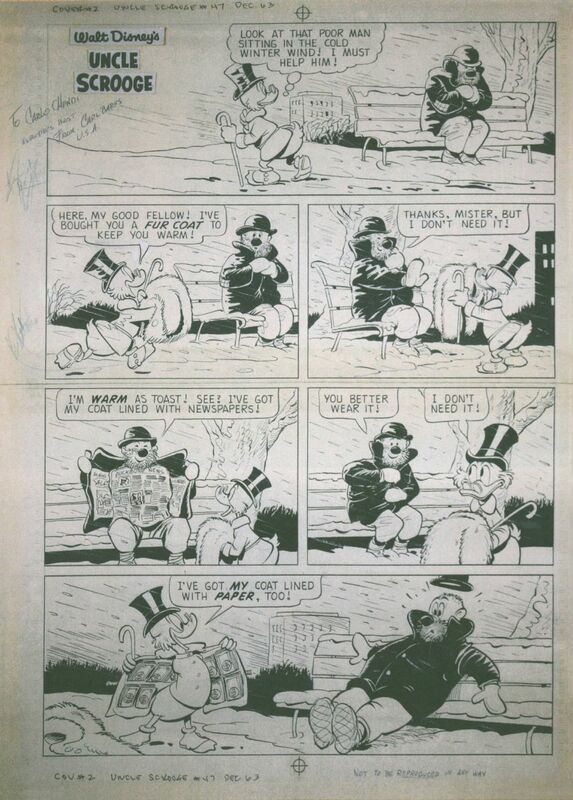 From this story the rejected 2`nd page has survived. The balloons were not done correctly, so the page was rejected. However, there are no big differences with the published page. The artwork is in private collection. The rejected 2`nd page has survived. 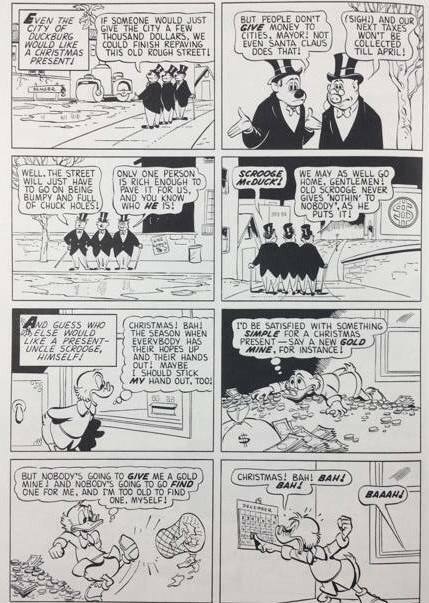 "Christmas Cheers" Page 2 - Upper half. 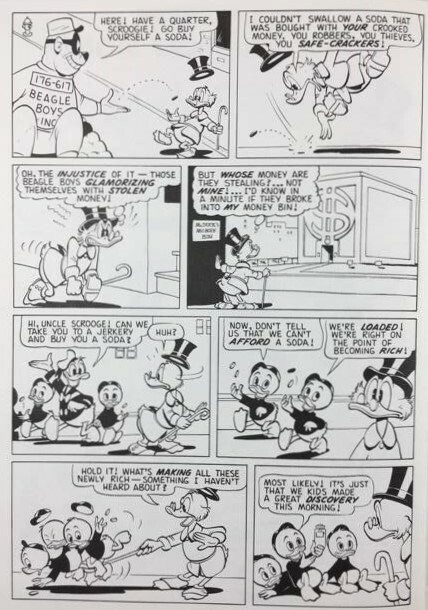 The page is the oldest example of a survived published comic book page with Scrooge McDuck. 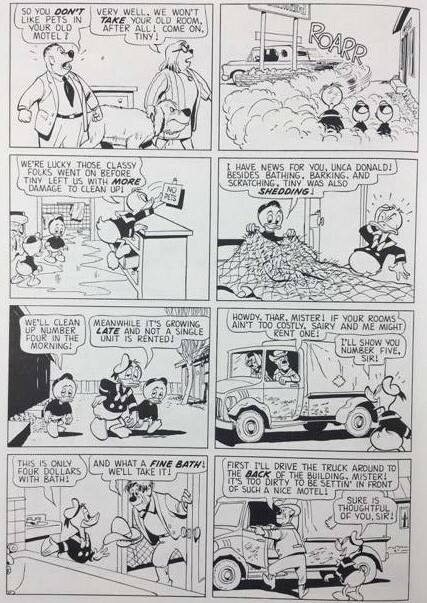 Original survived lower half page 2. 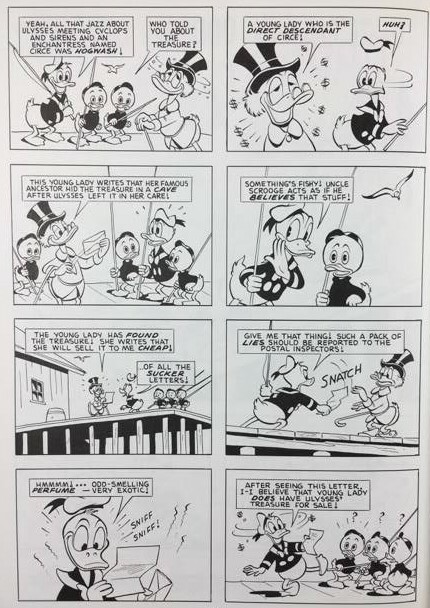 WDC & S. # 268 - page 7. The whole 10 pager has survived. "A Stone Throw from Ghost Town"
WDC 271 - April 1963. 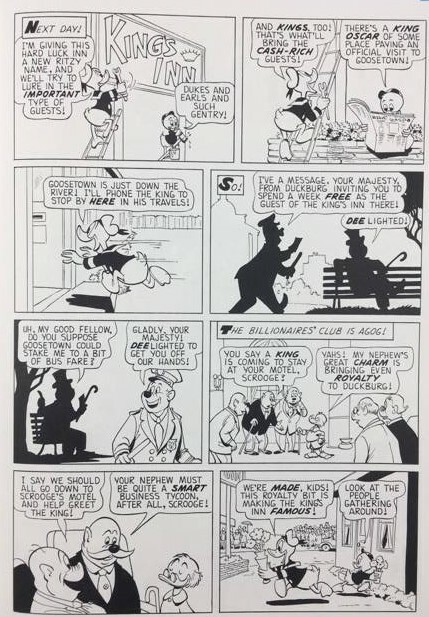 From this 10-pager only page 2 and 9 seems to have survived. The 2`nd page was sold on Heritage Auction on November, 14 - 2008 for 13.145 $. WDC -271 : Page 2. "A Stone Throw from Ghost Town" Page 2. 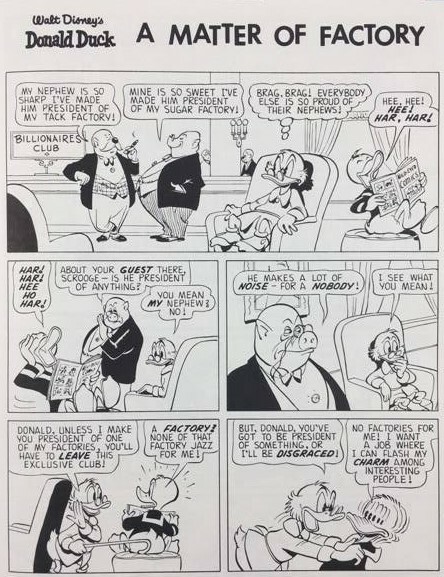 "The Case of The Sticky Money"
Published artwork. 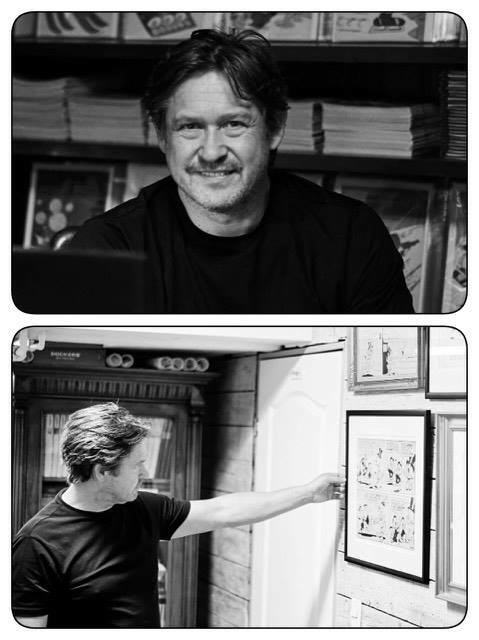 The artwork has found it`s home in Denmark. 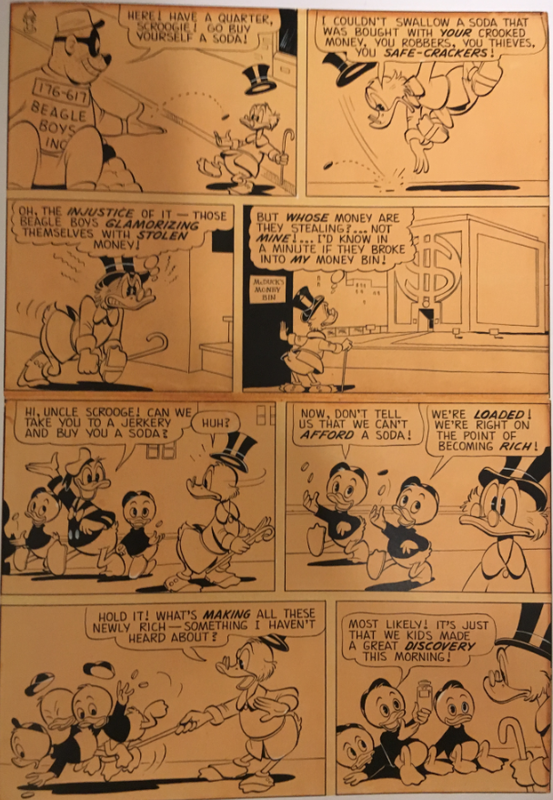 Notice that the survived published original artwork is "yellow" because it was glued up on a piece of wood. Someone also trimmed the edges of the page. The artwork is in private collections. 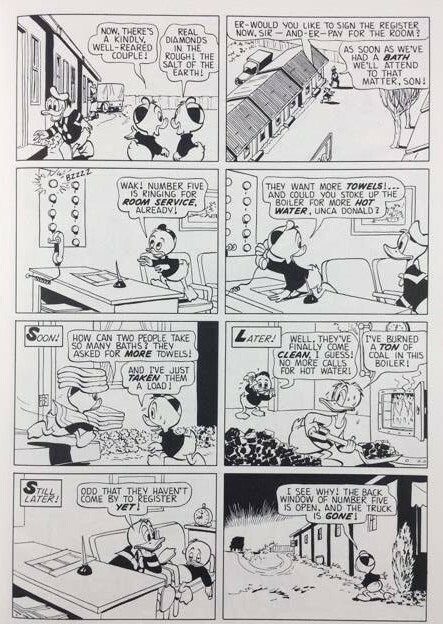 The Original page that Carl Barks sended to the Italian cartoonist Carlo Chendi in 1968. 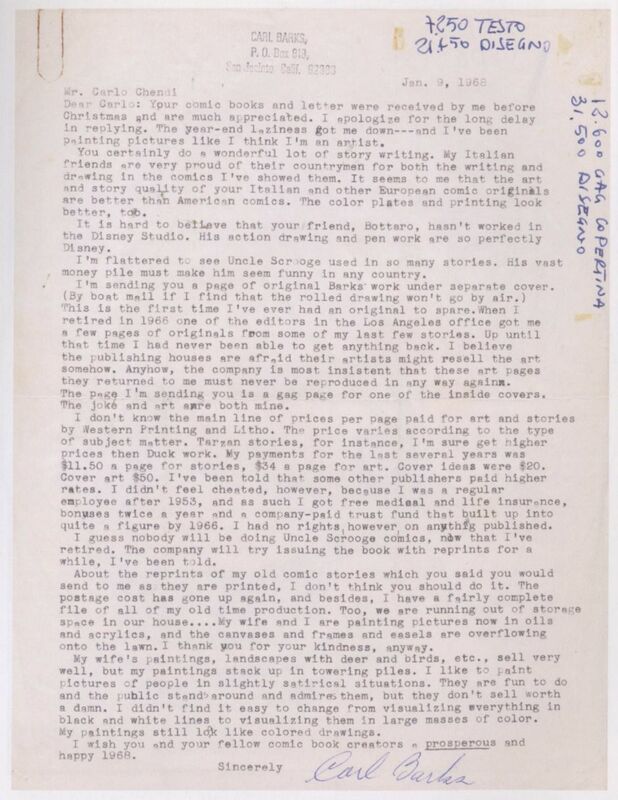 Dear Carlo : Your comic books and letter were received by me before Christmas and are much appreciated. I apologize for the long delay in replying. The year-end and laziness got me down---and I`ve been painting pictures like I think I`m an artist. You certainly do a wonderful lot of story writing. My Italian friends are very proud of their of their countrymen for both the writing and drawing in the comics I`ve showed them. 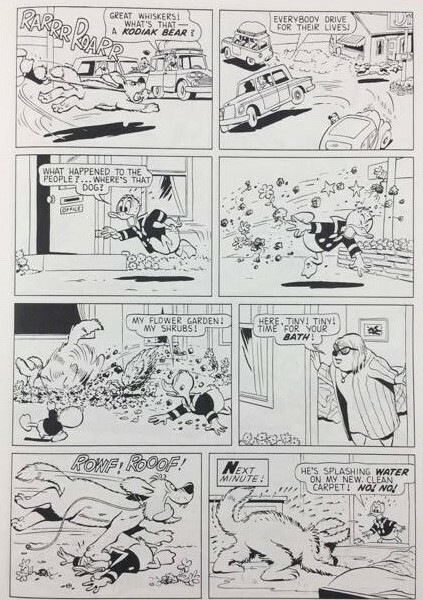 It seems to me that the art and story qaulity of your Italian and other European comic originals are better than American comics. The color plates and printing look better, too. It is hard to believe that your friend, Bottaro, hasn`t worked in the Disney Studio. 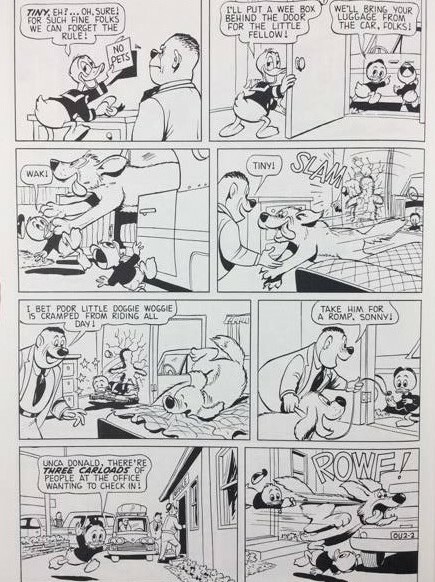 His action drawing and pen work are so perfectly Disney. 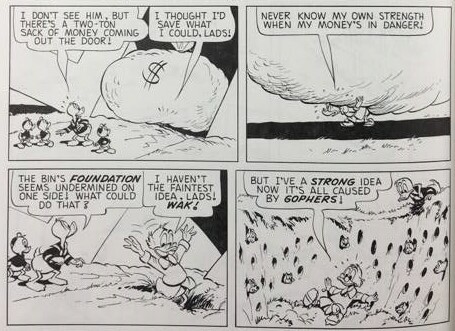 I`m flattered to see Uncle Scrooge used in so many stories. HIs vast money pile must make him seem funny in any country. 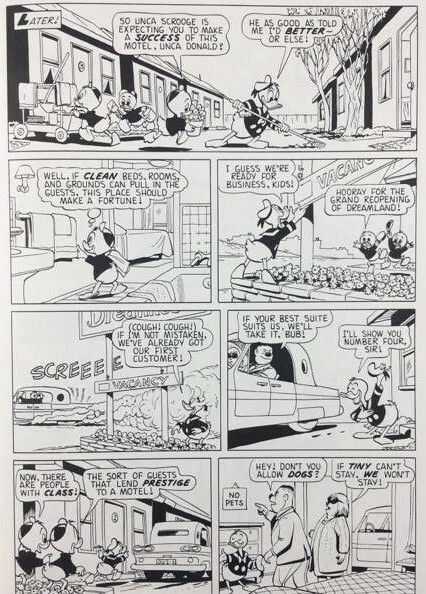 I´m sending you a page of original Barks work under separate cover. ( By boat mail if find that the rolled drawing won`t go by air. ) This is the first time I´ve ever had an original to spare. 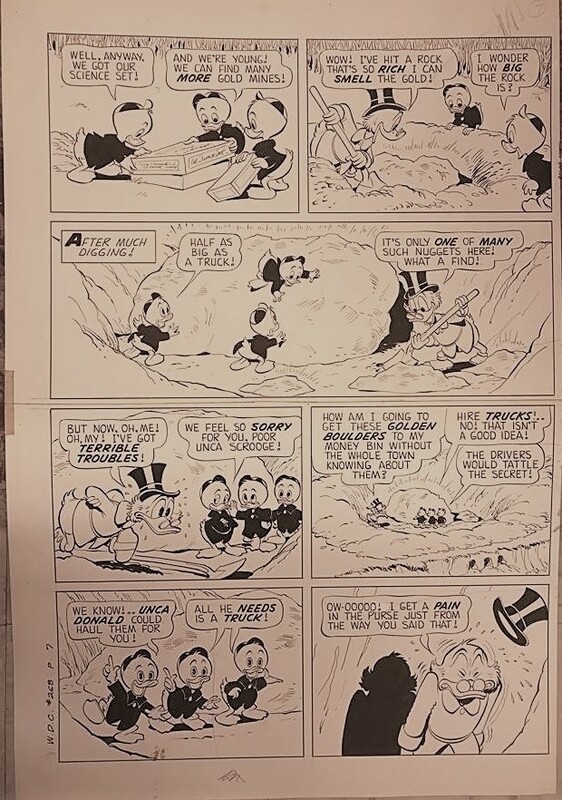 When I retired in 1966 one of the editors in the Los Angeles office got me a few pages of originals from some of my last stories. Up until that time I had never been able to get anything back. I believe the publishing houses are afraid their artists might resell the art somehow. Anyhow, the company is most insistent that the these art pages they returned to me must never be reproduced in any way again. The page I´m sending you is a gag page for one of the inside covers. The jok and art are both mine. 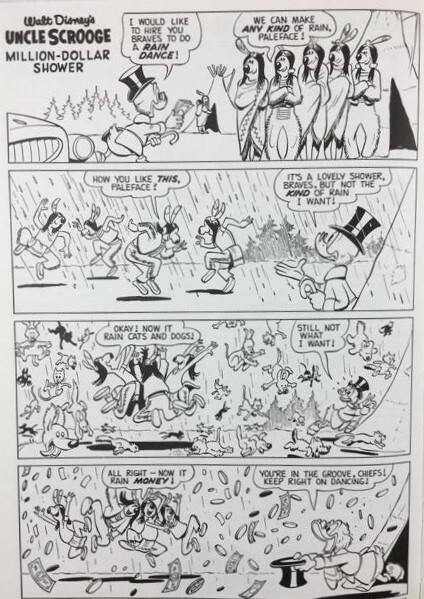 I don`t know the main line of prices per page paid for art and stories by Western Printing and Litho. The price varies according to the type of subject matter. Tarzan stories, for instance, I´m sure get higher prices than Duck work. My payments for the last several years was $11.50 a page for stories, 34 $ a page for art. Cover ideas were $20 . Cover art $50. I´ve been told that some other publishers paid higher rates. 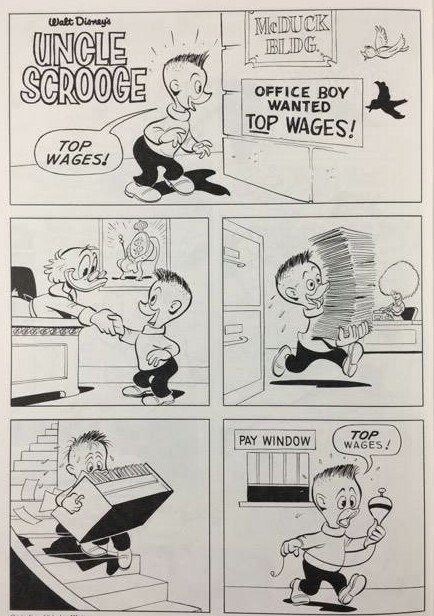 I didn`t feel cheated however, because I was a regular employee after 1953, and as such I got free medical and life insurance bonuses twice a year and a company-paid trust fund that built up into quite a figure by 1966. I had no rights, however, on anything published. 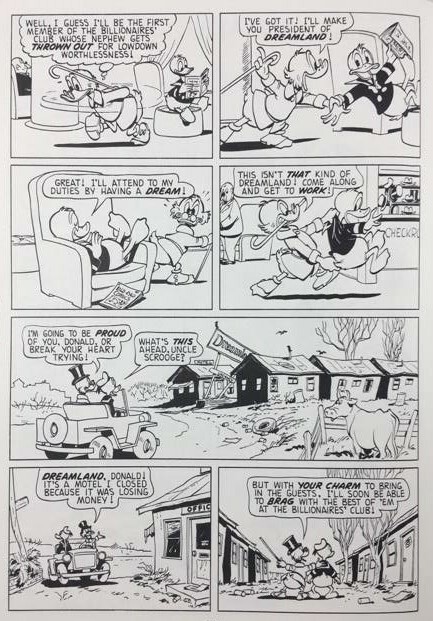 I guess nobody will be doing Uncle Scrooge comics, now that I´ve retired. The company will try issuing the book with reprints for a while, I´ve been told. 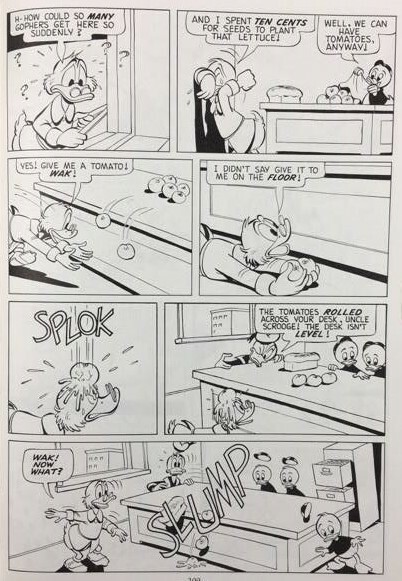 "How Green Was My Lettuce"
The story was originally 17 pages long but the editor cut off two pages. There exists one and three-fourths pages of rejected artwork. 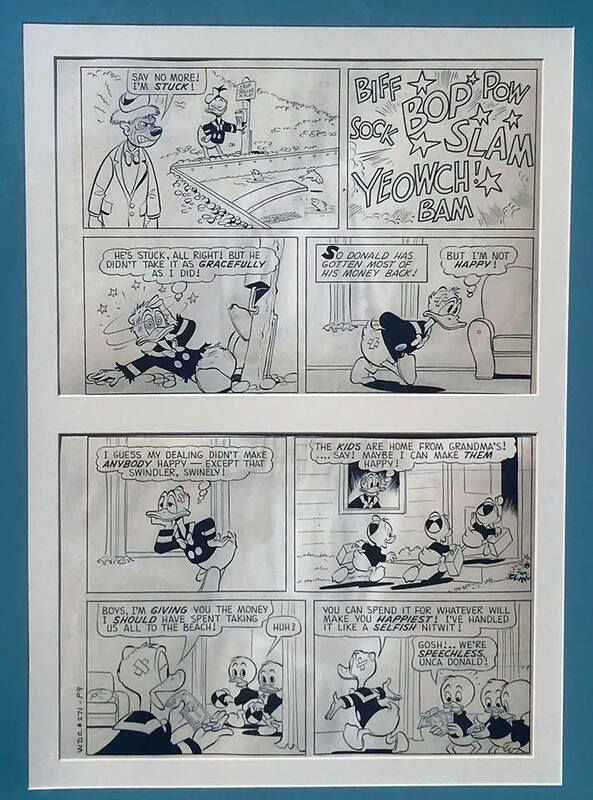 The surviving art includes the following pieces ; the two final panels of the 2nd page, the 3rd page and lower half of the 4th page. Unpublished artwork. The artwork is in private collections. Survived rejected artwork intended for US-51. The 2 final panels from the 2`nd page. Survived rejected artwork for US-51. The whole 3`rd page has survived. 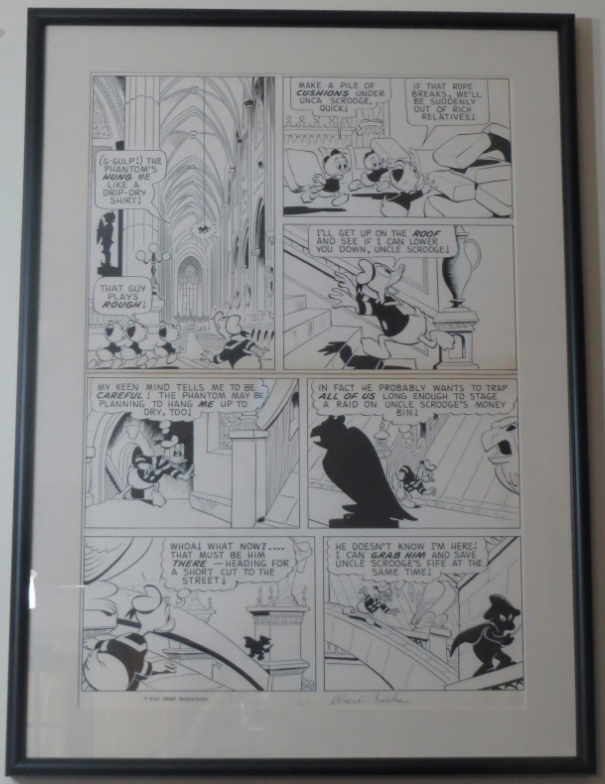 The upper half page was for sale at Galerie Laqua in 1992 for 2.500 $. The lower half of the 4`th page has survived. 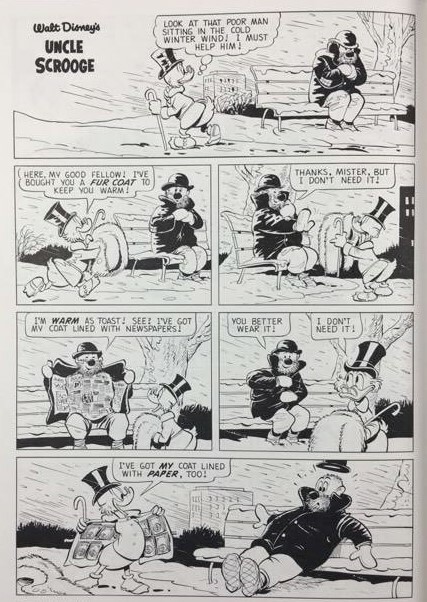 NOTICE : 1960`ies survived comic book pages continues..
US-59 : "North of the Yukon", US-60 : "Phantom of Notre Duck", US-61 : "So Far and No Safari", US-62 : "The Queen of the Wild Dog Pack", US-63 : "House of Haunts", WDC-308 : "Beauty Business".